At the trailer unveiling of her upcoming movie, Ileana was seen wearing a Tarun Tahiliani sari with jewellery from Amrapali. I can’t quite remember the last time we saw Ileana don a sari in real life, so this surely made for a welcome change. On an aside, I have to admit, she looked lovely in Baadshaho in all those bright chiffon saris. 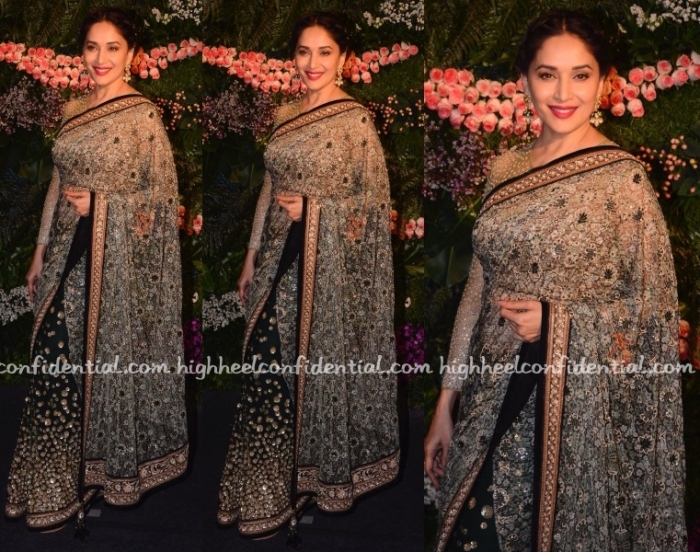 At the reception held earlier this evening, Lara was photographed in Tarun Tahiliani. Sleek centre-parted hair, big earrings and a matching Louis Vuitton bag rounded out her look. She looked good but the ironed out hair was bit of a downer. The look needed a certain lightness and the hair failed to deliver. Lovely as she looked, a wispy updo would’ve really helped elevate the look a coupe of notches. 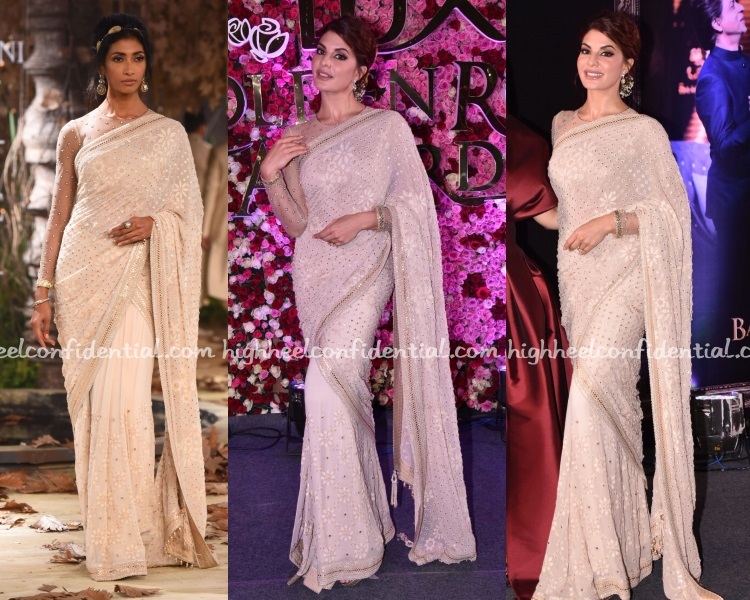 At Virat and Anushka’s wedding reception in Mumbai, Madhuri was seen in a Tarun Tahiliani sari with kundan jhumkis and her hair in an updo. Normally, I don’t like full-length sheer sleeves but here she looked absolutely lovely! It was all-black for Ms. Jessia at Ensemble’s 30th anniversary party who wore a Tarun Tahiliani skirt with a black shirt and a Chanel Boy. She looked good! Jacqueline attended the Lux Golden Rose Awards on Sunday evening wearing a Tarun Tahiliani sari from the designer’s couture collection. While she wears the sari impeccably, wasn’t a fan of the hairdo. I see Laxmi on the runway and love the sari on her so much more.